Our June event was a full day workshop on "How to be a competitive Software Engineer". The event was held on 6 th June 2007 at Hotel Ramada, Chennai was well appreciated by all the participants. 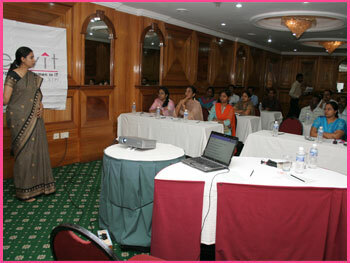 Ms. Sudha Gopal introduced the trainer Ms.Chitra Sood. As always, this event was also houseful with 20 participants. The trainer covered various critical factors for the young engineers to be much more than just a Software Engineer. Touching on Time management, Efficiency enhancement, Defect Management, Communication Skills, Goal Setting, Self analysis/grooming, EQ, IQ, Knowledge sharing, Team Work, etc., Ms. Sood helped the participants understand how they can be successful, efficient, and competitive Software Engineers and compete effectively with their peers in performance. Most of the participants were quite appreciative of the programme and its usefulness. As mentioned in the feedback form, the topics on defect management, communication skill, and team player spirit were very useful. They expressed the need for conducting more workshops on confidence building, quality assurance, Self improvement, tax planning, and stress management. The participation certificates were issued by Ms.Sarada Ramani and Ms. Indira Jagan.